Mumbai, 22 February 2017: Visa, the leading global payments network, today signed a Memorandum of Understanding (MOU) with the State Government of Andhra Pradesh to help transform Vishakhapatnam into India’s first “less–cash” city. This initiative is designed to provide the foundation for the city to emerge as India’s Fintech Valley, in keeping with the Chief Minister Naidu’s vision. 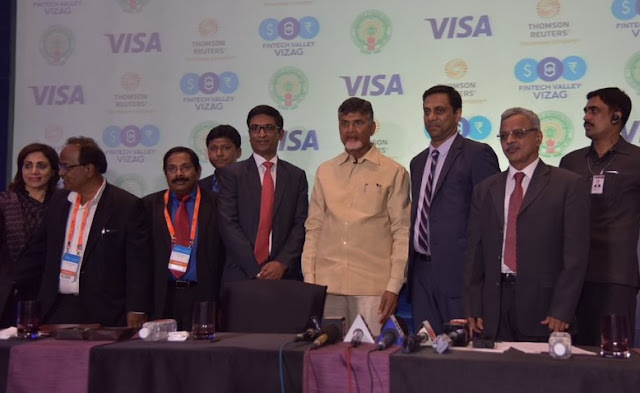 Chandrababu Naidu, Chief Minister, State Government of Andhra Pradesh, said, “We are delighted to partner with Visa, the leading global payments network on this strategic endeavor. Through this project, we hope to see a threefold to fivefold increase on the 6,400 merchants currently accepting digital payments, and to increase customer adoption of electronic payments by 75% to 100%." To accelerate its journey to less–cash and to becoming India’s Fintech Valley, Visa will collaborate with the Government of Andhra Pradesh to focus on three pillars. First, they will focus on driving payments digitisation. 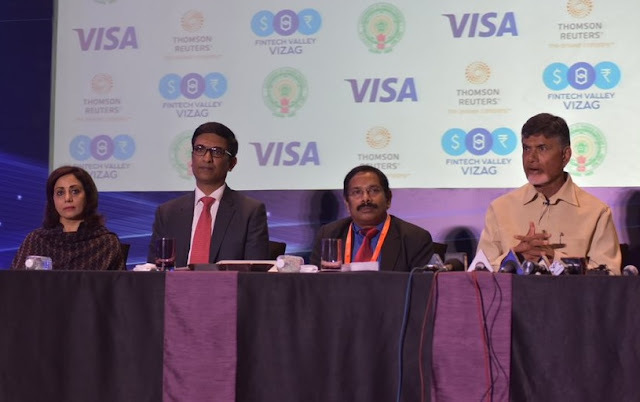 Visa, together with its partners, will work with key city agencies in Vishakhapatnam like the Greater Vishakhapatnam Municipal Corporation (GVMC), Common Service Centres, Andhra Pradesh State Road Transport Corporation, and key merchant segments like auto rickshaw drivers and the agricultural markets, to help digitize payments. They will also consider conducting campaigns that target underserved segments, such as women and small merchants, to help educate them on the benefits and drive adoption of digital payments. Visa will also focus on working with state agencies to adopt commercial payment solutions that could see them realise significant cost savings. In the second focus area, Visa will work with the city to help build the talent pool required in city organisations and in academia on emerging technologies like blockchain. For this, Visa will utilise its international reach to establish linkages with global experts in payments and FinTech. The third focus area will be to provide support to FinTech start-ups by providing access to Visa’s APIs, providing subject matter expertise, and participating in boot camps and hackathons. TR Ramachandran, Group Country Manager, Visa India & South Asia, said, “Visa welcomes the opportunity to partner with the State Government of Andhra Pradesh on this unique and strategic endeavor. We propose to undertake this initiative as a part of Visa’s global financial inclusion efforts that aim to provide 500 million underserved with a payment account by 2020. Electronic payment acceptance across Vishakhapatnam is better than most cities in India at a per capita penetration of Point Of Sale terminals of 273, relative to India’s median of 489. However, it has significant room to improve in achieving best–in–class per capita level of 20. Visa is a global payments technology company that connects consumers, businesses, financial institutions, and governments in more than 200 countries and territories to fast, secure and reliable electronic payments. We operate one of the world’s most advanced processing networks - VisaNet - that is capable of handling more than 65,000 transaction messages a second, with fraud protection for consumers and assured payment for merchants. Visa is not a bank and does not issue cards, extend credit or set rates and fees for consumers. Visa’s innovations, however, enable its financial institution customers to offer consumers more choices: pay now with debit, ahead of time with prepaid or later with credit products. For more information visit www.visa.co.in.